I do believe I have found my all time favorite color combo for Holiday card making. Dark Gray and White...with just a splash of color. Today's favorite color is Metallic Teal. Have you seen the latest release from The Project Bin? 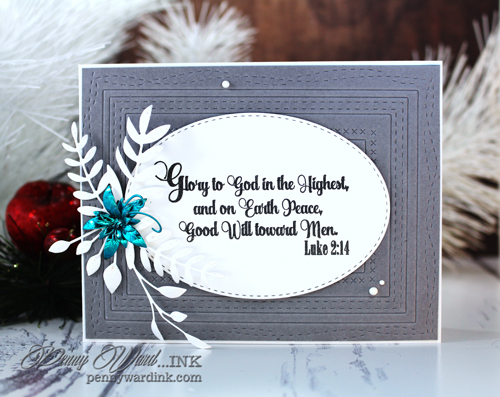 Luke 2 stamp set is a HUGE hit! Great for card making, scrapbooking, Bible journaling!!! Look at all those wonderful verses!!! My whole card today involved die cutting. Gray background is All Framed Up (that was actually embossed, not cut). 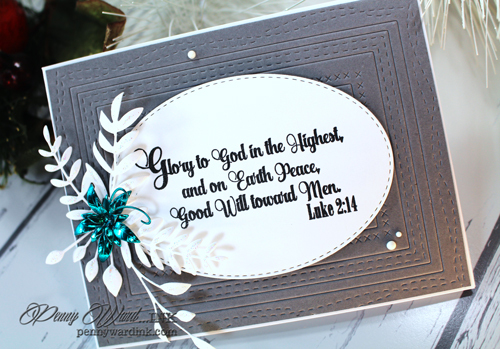 A stitched oval with the wonderful verse stamped and heat embossed. 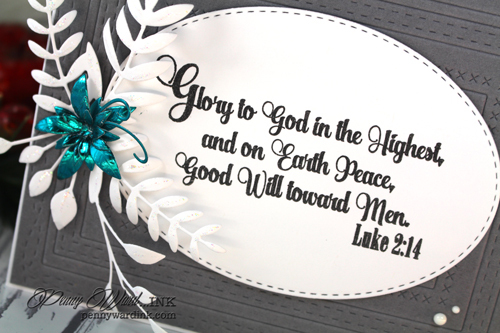 The White foliage is from PoppyStamps. Note: Metallic Teal is foil. Die cut the Poinsettia from the Ornament die.